When i am running DOSBox 0.74 on Windows 10 the Windows screensaver / standby timeout will be blocked. Is there any possibility to disable this future? For Linux i found the solution by setting the environment variable SDL_VIDEO_ALLOW_SCREENSAVER. Is there a same solution for Windows? 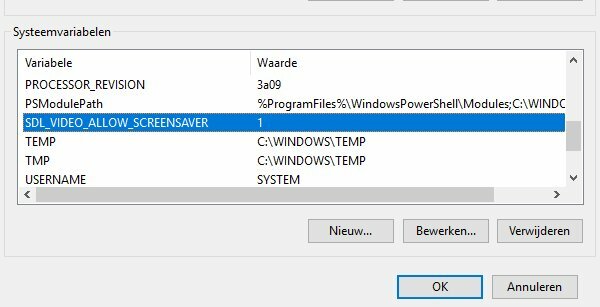 Does setting that variable not work in Windows? Who even uses screensavers these days? Also, you wouldn't want the screensaver to activate whenever you are playing, so that's only natural. So don't get your hopes high. I add the environment variable like this way, but it don't works. Maybe i did something wrong? Unfortunately I know nothing about SDL, so I can't help you. olddos25 wrote: Who even uses screensavers these days? Also, you wouldn't want the screensaver to activate whenever you are playing, so that's only natural. So don't get your hopes high. If you have an OLED display you will want to. OLED has a burn in problem. It is why Roku has a screensaver.